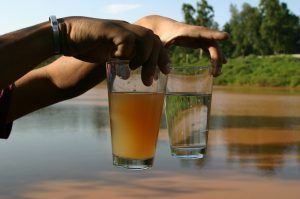 We are all very much aware of the need for safe drinking water; this is no great secret. The need for potable water is indeed a global issue. For those situations where you are off grid and disconnected from a trusted piped supply, bottled water has, in general, been the method of having a safe source of drinking water. The logistical cost, and risk of bottled water can be staggering, from purchasing of the product through to deployment, not to mention the pollution from such an oil hungry process. 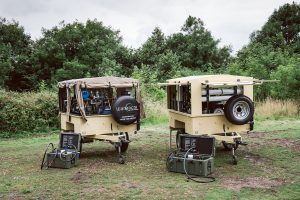 Tough, reliable, high quality mobile water purification systems designed to withstand the harshest of environments to produce fresh, drinking water direct from source. The systems have to “do what it is says on the tin”. They are intended to be relied on to provide water for human survival. …but the video speaks for itself! The Team at Wananchi work directly with all of our customers to fully understand their projects and ensure the best system is chosen; the project is always as individual as the people working them. How many people will be needing water? Is there a known daily required volume of water? What is the water source or sources likely to be? Will the water be used for purposes other than drinking? Séon water purification systems have been scaled to cater for a wide range of scenarios with different water outputs. All sizes have choice for fresh water and seawater capability. Typically, the deploying of bottled water for international disaster relief and military environments costs between $1.7 to $2.1 per litre. For a more local, national, response it can cost in the region of $0.5 per litre. The cost for a litre of water produced by a Séon UV water purifier is typically $0.05 per litre and can be as low as $0.004 per litre; with our larger systems this can get considerably lower. Séon produced water is similar in price to UK municipal water from our taps. The risk involved in deploying water can be high, traversing a harsh environment with poor or no roads brings its own set of problems putting at risk teams of people carrying out the task. 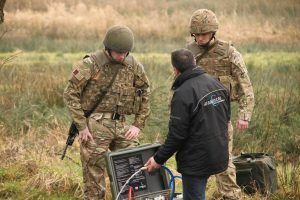 Throw in security issues of a war zone where the water will need to be protected to ensure the end user survives, you can imagine the logistical challenge that this presents. Water can be over 50% of total war theatre logistical cost. Power should always be considered for a mobile water purifier. All Séon purification systems come self-contained with integral pumps and power packs, the power coming from either a 12v battery or engine powered generators. Wananchi offer solar options for all of our systems to reduce the reliance on carbon generated power, from fully flexible and foldable solar mats through to prepared containerised solar systems. With ability to cut the pollution from plastic bottles down to zero, cutting carbon footprint using solar makes Séon extremely environmentally friendly. One of the first questions anyone ever asks is “how long do the filters last”? Quite simply, this is dictated by the quality and the volume of water processed, The clearer or less turbid the water, the less work the filter cartridges have to do. Trying purifying water from a muddy puddle, expect the cartridges to clog quickly, purify an untrusted municipal water supply and expect ten’s of thousands of litres of drinking water to be produced between cartridge changes. Our mid trailer and containerised systems have washable pre-filtration components added to increase filter life significantly. Read our information page “The Golden Question” to learn more about source water quality and filter life. Without doubt, the most important aspect of portable water purifier, is of the quality of the water it produces. Séon water purification systems have been designed, developed and integrate the highest quality components. Stringent manufacturing a procurement processes ensure that every part that water is in touch with is food safe with all manufactured parts machined to exacting standards. Filter cartridges and RO membranes are manufactured by world leading brands and commonly used in hospitals where sterile water is critical. All of our systems are batch and or indiviudally tested by a UKAS laboratory to certify that our systems produce potable water. Water quality in all Séon water purifiers, meets or exceed the standards set by the World Health Organisation for drinking water quality. Wananchi itself adheres to a strict ISO9001 quality system aligned for the manufacture of water purification systems. We are audited annually by an independent, international auditor, SGS ltd, to ensure our compliance to the quality system. See are certification here. Séon mobile water purifiers are designed and manufactured to provide life saving drinking water; they are built to work and trust. Wananchi works with all of its clients on a one to one basis to fully understand their water purification requirement and will build re-supply programmes to suit along with projected cost per litre and return of investment calculations to qualify your savings when using Séon water purifiers. Wananchi can offer full training including ‘best use practice’ and product servicing at its facilities in the UK with optional remote monitoring on some of its larger systems. Séon water purifiers are all available with a static version for use in permanent installations whilst Wananchi can also offer bespoke systems to specific project requirements. As mentioned above, mobile water purification systems remove the waste from plastic bottles. For every hour using Séon UVT, you can prevent the need for over 7000 plastic water bottles being distributed. Just take a moment to think about it. If you operated Séon UVT in a disaster zone for just 4 hours a day over the course of 1 week, the distribution and subsequent waste of nearly 200,000 water bottles can be eliminated. We found what this looks like in an excellent video by the Orlando Sentinel to demonstrate this. Now try to imagine what 2 or 3 months worth of bottles would look like during a crisis.